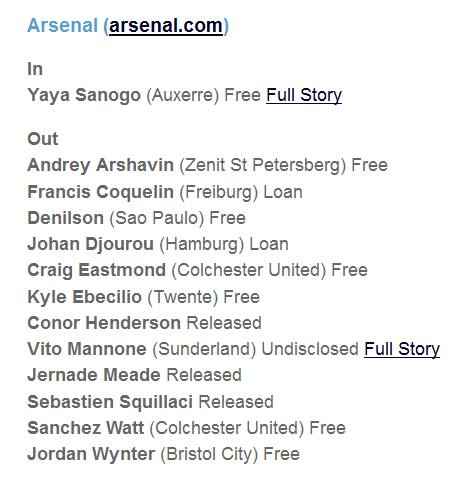 Arsenal Transfers So Far This Summer . . . The Premier League have a very useful page here listing all the ins and outs from PL clubs so far this summer. I bet Sky are off somewhere adding up all the money shifting around too. To save you clicking and getting your hopes up, here’s the latest Arsenal news: As you may be aware, rather more out than in so far. And that’s just the ones most people have heard of, as I believe quite a few more youngsters have also been released this summer. The team are off on their private jet to the Far East today, so we may have to wait a bit longer for transfer news. I’m sure it will come, despite what Edna the cleaning lady told me. July 11, 2013 in Uncategorized. Barter? How about Ivan and the BoD in part exchange? How about Ivan and BoD in part exchange? The whole point is so far. Of the 12 gone, 6 are youth players, none of whom have broken through at any time. They look like the ones that are either never going to male it, or have hit the post 21 brick wall. At worst we’ve lost a nominal fee from a league 1 club. By the way, I know we’ve released about 15 from the Academy/reserves in total, but we released 12 last year, so its business as usual — 9 of those were on a free as well. Of the other 6 players, we got money for Vito, Djourou is on loan, and we’ll get money for him next year if he stays there. Coquelin is another loan. — He’s in the post 21 but not quite good enough yet category, so loaning him is the only option if we want to keep him long term. The last 3 are where you’d want to see money come in, but considering we’ve been trying to offload then for years and failed; what else can you do? Running Arshavin and Squilaci’s contracts down finally gets them off the wage bill, and liquidating Denilson’s seems to have been picked as the lesser evil. Now if the top half of that list isn’t significantly bigger by the end of August, you can forget angry, bypass livid and just go to the torching the stadium stage, but I just cannot see that happening. £200,000 a week + whatever we’re not paying Djourou – whatever we are paying São Paulo to take Denilson off our hands. If the money doesn’t end up paying for the diamond-encrusted collar for Ivan’s fluffy white cat, and the frickin’ laser beam upgrade for the stadium guards, we can fund the wages for new players and keep the the overall wage bill stable. I cannot see any argument that we’ll miss any of the 12 departed players, so its the best of both worlds. We just have to prise the money out of the clubs’s reserves to pay for them.